Sphygmomanometer is an instrument used to measure blood pressure. 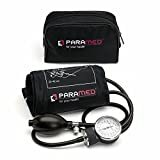 A sphygmomanometer is also known as a blood pressure meter, blood pressure monitor, or blood pressure gauge. The device consists of an inflatable cuff, a measuring unit and a mechanism for inflation which may be a manually operated electrically operated. Manual meters are used by trained professionals and require auscultation by stethoscope for an accurate measurement. A reading of the systolic blood pressure can be obtained by palpation. Two kinds of manual sphygmomanometers are available. Mercury sphygmomanometers work by measuring the blood pressure by noting the height of mercury column and do not require frequent calibration. Baumanometer is wall mounted mercury sphygmomanometer. Mercury sphygmomanometers are considered to be the gold standard. Aneroid sphygmomanometers are mechanical in type and come with a dial. These require frequent calibration checks which may alter due to mechanical jarring. Digital devices use oscillometric measurements and electronic calculations do not require auscultation. Instead, the reading is displayed on the screen. This makes them easier to use than mercury or aneroid types and especially for the non-trained personnel. The inflation method could be manual or automatic. These digital devices are less accurate than manual devices though and may not be advisable to use in critical situations. They are accurate in the measurement of mean blood pressure and pulse rate though. 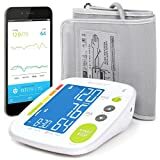 How to Measure Blood Pressure with Sphygmomanometer? It is important for the patient not be anxious. An anxious patient must be calmed by reassurance as anxiety will increase the blood pressure and erroneous reading would be shown. The following steps are described as in manual types but the approach is similar in the digital types. Clothing should be removed from the arm. If it cannot be removed, it is better to leave it as it is, rather than fold the clothing into tight constricting bands. Blood pressure can be measured in supine, seated and standing positions. The most accurate reading is when the cuff is, at roughly the same vertical height as the heart. Sometimes the health care personnel take readings in more than one position to confirm or rule out certain diagnoses. In normal people there is no significant difference in BP between supine, sitting and standing positions provided the arm is supported at the heart level. A right cuff size is very important. The basic purpose of the cuff is to occlude the brachial artery circulation by external pressure and then measure the values at occlusion and then return of the circulation. If the cuff is small, it would require a higher pressure to occlude the artery and thus get an erroneous higher pressure reading. A lower reading would be seen in the large cuff. Encircled the around the arm smoothly and snugly. The length of the cuff’s bladder should be at least equal to 80% of the circumference of the upper arm. However, in cases, where the bladder of the cuff does not encircle the arm completely, the center of the bladder should be over the brachial artery. The brachial artery lies in anteromedial aspect of the arm in the lower half. The rubber tubes from the bladder are usually placed inferiorly at the site of the brachial artery. A correctly placed cuff will be 2-4 cms above the crease in your elbow, and tubing hardly restricts auscultation. Place the diaphragm of the stethoscope on the cubital fossa. Lightly press the stethoscope’s bell over the brachial artery just below the cuff’s edge. When the knocking sound disappears, that is the diastolic pressure. If the subject’s pressure is elevated, measure blood pressure two additional times, waiting a few minutes between measurements. In the case of digital sphygmomanometers, there is a button that needs to be pressed after the cuff has been applied. Earlier digital had manual inflation but those are not in the vogue now. 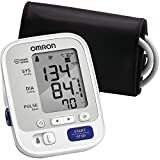 Pressing of the button leads to inflation and then the device calculates the blood pressure based on pressure inputs and electronic calculations. The reading is displayed on the screen. A thigh cuff containing a large bladder (18 x 24 cms) for adults can be wrapped around the thigh of the prone patient and the Korotkoff sounds auscultated in the popliteal fossa in the usual way. Blood pressure in the legs is equal to that in the arms provided the bladder is adequate in size. Explain the procedure to the patient to allay anxiety. The arm must be supported to the heart level. The unsupported arm does not relax fully and can lead to a rise in diastolic blood pressure. In the supine position, the arm is usually at the heart level. In sitting and standing positions the arm must be horizontal with fourth intercostal space at the sternum. The BP may be higher in the right arm by 2-10 mm Hg. Most pressures in practice are measured on the right arm. However, if the BP is higher by 10 mm Hg in one arm, further measurements should be made in that arm. A loose cuff may give a false higher BP. At least 15 seconds should be allowed between successive measurements.